Please fill out the form below and our legal team will contact you. Attorney Berkun will utilize the proper resources to conduct a thorough investigation in support of your claim. Call us to request a consultation or chat with us online. Our legal team understands the pain you are currently suffering and will work tirelessly to recover all resulting damages. 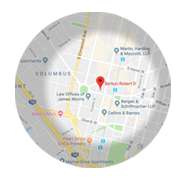 For years, Robert Berkun has loyally assisted clients in Buffalo, NY with their legal needs. Have no doubt that Robert Berkun retains the experience and knowledge to achieve positive courtroom results. All you have to do is reach out to our certified team to schedule your preliminary consultation. From there, it’s only a matter of time before we can start to fight for justice in your case. ©2018 Robert D. Berkun. A personal Injury attorney serving New York State. Disclaimer: The legal information presented at this site should not be construed to be formal legal advice, nor the formation of a lawyer or attorney client relationship. Any results set forth herein are based upon the facts of that particular case and do not represent a promise or guarantee. Please contact a Personal Injury Attorney for a consultation on your particular matter. This web site is not intended to solicit clients for matters outside of the state of New York State.